Transformer enhanced technology for superior sonic performance. Bringing science to sound. The Jensen Twin Servo 990 Mic Preamp is considered the world's finest mic preamp by audio experts. It's the ideal integration of advanced design software, hardware, engineering know-how, and carefully controlled 'golden ears' tests. It has earned high marks for sonic performance since its introduction in 1988. The basic circuit was originally published as an application note by Jensen Transformers for their finest microphone input transformer, the JT-16-B. Each channel uses two precision 990C operational amplifier modules, developed and patented by Deane Jensen, to achieve one tenth the distortion and twice the bandwidth of a single stage design. The Jensen Twin Servo 990 mic preamp has a 19" wide mainframe rack-mount chassis (1.75"H x 19"W x 8"D) and can be ordered with 1 to 4 channels. Additional channels can be easily added later up to the total capacity of the mainframe. • JT-16-B Input Transformer. Jensen's best mic input model. • Two 990 Discrete Op-Amps Per Channel. Faster, quieter, more powerful and better sounding than typical monolithic op-amps. • Elimination Of All Coupling Capacitors From The Signal Path. Results in less degradation of the audio signal. • JT-11-BMQ Output Transformer. Jensen's best line output transformer. • Input Bias Current Compensation Circuitry And DC Servo Circuitry. Eliminates signal degrading coupling capacitors. • Fully Sealed Conductive Plastic Gain Control. Provides smooth continuous gain adjustments from 16dB to 60dB. • 20 OHM MIC switch or 20dB PAD switch. • All Front Panel Switches Are LED Illuminated. • Gold Plated XLR Connectors for maximum reliability. • Ground Lift Switch On Each Channel. Helpful for eliminating ground loops. 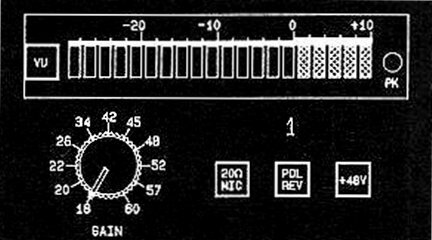 • VU-1 meter. Very accurate and informative 20 segment LED meter, with separate Peak LED, for monitoring preamp output. • Toroidal Power Transformer With Additional Shielding. Eliminates hum problems so no external power supply is needed. • Universal Power Supply. Internal switch provides six primary voltage choices to accommodate use anywhere in the world. • Chassis Ground Isolation Switch. Helpful for eliminating ground loops. • Pin 2 Or Pin 3 High. Internal jumpers make changes in the field easy. Unless otherwise specified : 25°C ambient, 150 ohm source, 600 ohm load. (1) Low frequency response distortion is almost entirely 3rd harmonic. (2) Worst case of maximum possible input at minimum gain with unclipped output. (3) Handles extend 1" beyond the front panel. "Twin Servo" is a registered trademark of Jensen Transformers, Inc.
©1997-2015 by The John Hardy Company - Unauthorized Use Prohibited!